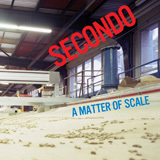 A Matter Of Scale is the debut album by Secondo, the moniker for Italian/Serbian electronic artist Radovan Scasascia. Secondo combines cut up disco micro-samples to create new minimal beat driven songs. After several 12″ releases on his own label Dreck Records and also for Soul Jazz this is his first album proper. He also releases music under the name AM/PM. Brilliant stuff!